Usually, natural streams are dredged and made into channelized drains for the purpose of draining wet areas. 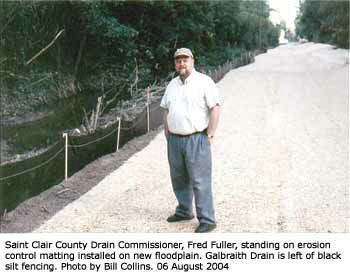 I've been working a bit this summer on a project in Fort Gratiot Township with Fred Fuller, the Saint Clair County Drain Commissioner, in which the opposite has happened. Part of an old channelized drain has been transformed into something closer to a natural stream, in order to provide flood relief for landowners on the lower stretch of the Galbraith Drain. The Galbraith Drain is the outlet for storm water discharge from the Detroit Water and Sewerage Department (DWSD) Lake Huron Water Treatment Plant located along the south side of Metcalf Road. It also provides drainage for approximately three additional square miles of residential and agricultural land in Clyde, Grant, Burtchville, and Fort Gratiot Townships, flowing directly out to Lake Huron. The Galbraith Drain Project is designed to reduce flooding without the need for widening and deepening the drain where it runs between some homes along Lake Huron and other sensitive lands. Instead, upstream flood storage areas have been created by excavating an artificial floodplain along the drain on the DWSD property. This will store flood waters during major storms and release it more slowly, just as happens in most natural streams that meander and have natural floodplains. In some sense, the problem began when the original natural creek was channelized in the late 1800s and made a county drain. While this created a bigger, deeper channel that could handle a larger volume of flow, it also forced the channel to receive more water from adjoining wetlands than it ever did naturally. Then, the drain was relocated in 1969 during construction of the DWSD water plant, and made into a deep ditch with very steep banks and a tall spoils berm. Natural streams balance flow with storage, moderating downstream volumes. A straight drain channel is all about sending high volumes of water downstream as fast and thoroughly as possible, which can make the lower drain prone to flooding. This is not to mention the destruction of the natural stream environment and poor water quality that is caused by traditional dredging and channelization. A big part of this latest Galbraith Drain Project was to protect glacial beach ridge and swale habitat through which the drain was originally dug. I wrote about this habitat in the December 2003 and January 2004 issues. It consists of a series of sand ridges with low muck wetlands between, deposited successively as the high glacial melt waters of Lake Huron, which extended a few miles inland from the present shoreline, began retreating about 4,000 years ago. This habitat contains uncommon plant species like Yellow Lady's-slipper orchids and Purple-flowering Raspberry, an occasional Eastern Hognose Snake, and an abundance of warblers, especially during the spring migration. The most intact portions of this habitat were flagged on the DWSD property and excavation was limited mostly to areas that had been impacted by previous dredging projects. As shown in the photographs, basically a shelf was excavated alongside of the drain that will serve as a floodplain, a flat area that receives floodwaters from the adjoining watercourse. The photograph with the backhoe shows sand being removed down to the lakeplain clay, a layer of clay deposited thousands of years ago by Lake Huron. 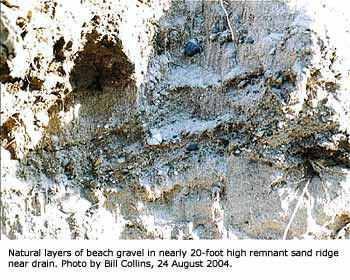 Notice that groundwater is seeping down through the sand to the clay, where it then flows out to the drain channel. During the course of this project, we identified what we think is a small intact portion of the original main sand ridge that ran along the western extent of the glacial beach ridge habitat. It runs for about 300 feet on the west side of the drain and is nearly 20 feet high, providing a fairly dramatic view of the surrounding land compared to our usually flat region. Natural layers of sand, beach gravel, and lake shells are apparent even near the top. The biggest and oldest sand ridge in this habitat was largely mined out decades ago. It was furthest inland and ran from Port Huron all the way up through Sanilac County, ranging up to 500 feet wide and 20 feet high. The Drain Commissioner's Office designed this project with the help of Huron Ecologic and Huron Environmental. Sheldon Construction of Fort Gratiot Township was the main excavating sub-contractor and did an excellent job. The project was funded mostly by the DWSD, but also by a Great Lakes Basin Program grant from the Great Lakes Commission, a binational agency of the United States and Canada. 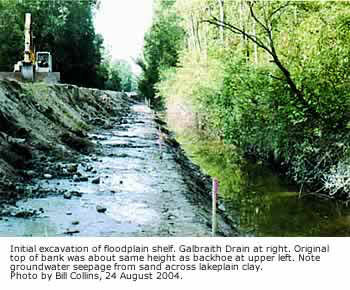 The Galbraith Drain Project was one of 42 selected for funding in 2003 by the Great Lakes Commission. Since 2000, Drain Commissioner Fred Fuller has been awarded over $1.4 million in state and federal grants to improve water quality in Saint Clair County.